(¸.•´ (¸.•`¤~♥I am so proud to be featured in Altered Couture Magazine, Spring & Summer 2017 Issues! Since 2007 I've thoroughly enjoyed being a seller on Etsy and I'm very grateful to be able to showcase my designs in this little corner …of the world wide web. What I strive to incorporate in every item is years of sewing expertise, my feel for the ebb and flow of fabric and an eye for color. When I come across a vintage or kitschy garment, I always try to maintain its original character and build around it and to maintain it's "history". My sewing machines are my paintbrushes ~ the fabrics, my paints and as an artful composition, the end product is hopefully the result of a journey and not a pre-determined design. I've been sewing since I was a teen in the 60's. My passion is "cheeky boho charm" from those wonderful years gone by when torn blue jeans were a proclamation and not a fashion statement, when I was a teen in the 60's. I am always available at a moment's notice with any questions or comments. Herkimer diamond gemstone ring,raw crystal quartz,sterling silver engagement ring,branch,twig,alternative April birthstone,rough stone ring. 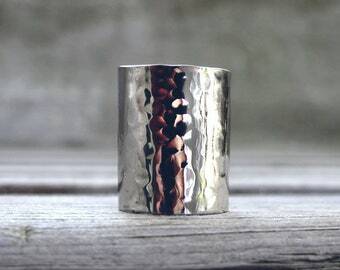 Stacking rings hammered sterling silver,brass,flower,blossom,handmade. Nora hasn't made any lists... yet.